Today a lovely red package arrived at my door, which was a completely new and exciting experience for me. The package itself was not the surprise. The surprise was that it did not contain books I had ordered, but a book that one of my favorite authors had promised to send me to read and review. 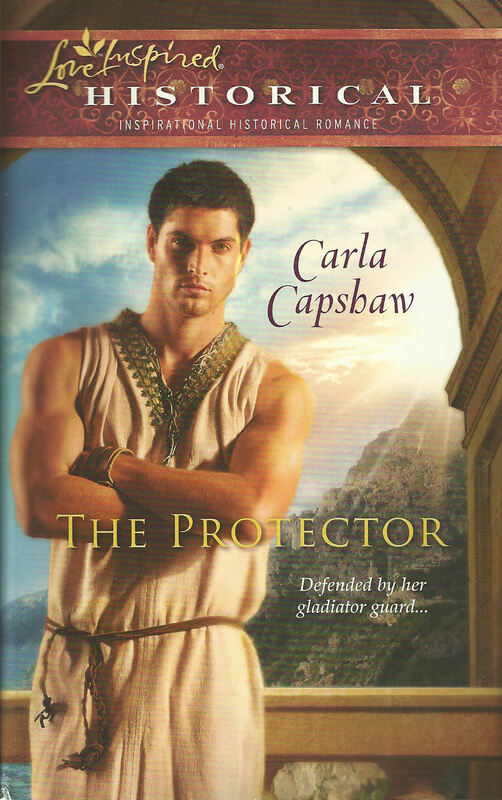 That author is Carla Capshaw, who has written The Gladiator, The Protector, and The Duke's Redemption and the package included TWO books instead of the one promised, both signed by the author, a sweet card addressed to me, and a cute "Little Inspy Trading Card". So, here are the books. Quintus Ambustus is a slave--Adiona Leonia is a wealthy socialite. He fights for his life in the gladiator's ring--she plays cutthroat politics in Rome's high society. He's sacrificed everything for his Christian faith--she believes in nothing and no one. But when Adiona's life is threatened, Quintus is chosen as her bodyguard, and their fascination with one another shocks them both. Neither thought to find joy in a match society would condemn...but their feelings cannot be denied. Have they lost too much to believe in happiness? Or will their growing love let them leave the past behind--and build a new future together? Triumphs in the Coliseum-and society bedchambers-made gladiator Alexius of Iolcos famous for his brutal skill and womanizing ways. Yet the only woman who intrigues him is Tiberia the Younger, who now needs his help. Protecting Tiberia places Alexius in the greatest danger he has ever known-from her vengeful father and his own heart. Becoming a temple priestess may be an honor, but Tibi can't bear to surrender her freedom or her newfound faith. Alexius's solution stuns her. Marriage.to a gladiator! Scorned by her noble family, Tibi always felt unworthy. 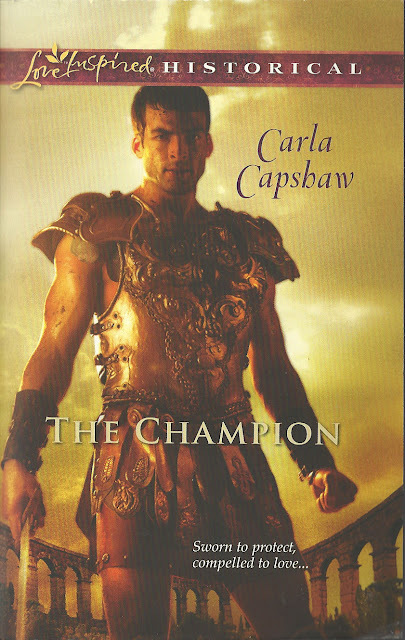 But with her champion by her side, can she accept-and give-a love strong enough to vanquish their enemies? Should anyone learn she is a Christian, Pelonia will be executed. Her faith threatens not only herself, but her master. Can she convince a man who found fame through unforgiving brutality to show mercy? 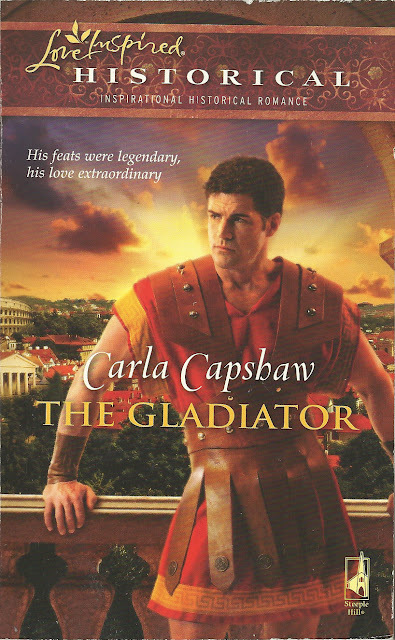 And when she's ultimately given the choice, will Pelonia choose freedom or the love of a gladiator? I just want to say here that this book is everything one would want in historical fiction, romance and action and I would even recommend it to someone who doesn't read christian fiction, because it is not at all preachy. It is a rather deep book, however, and one that makes you think, whether you are a christian and agree with the characters' beliefs or not. Hopefully, I will review the rest soon, I'm looking forward to savoring them. Sorry for blowing up the covers, I just love them so much, I couldn't help it. But Carla did it, and I thank her for giving me the opportunity to feel the excitement that I see many other book bloggers taking for granted. "Do you realize, someone on the other side of the planet actually wrote these words, with their hand, in another language, and now you are holding them in your hand and reading them." I nodded, speechless at the amazingness of it myself. He gave the card back to me and I held it reverently. A few minutes later I showed it to him again. "Look what came in the mail for me!" I said, as though we were reenacting the whole scene. "Haven't I seen this card somewhere before?" And no, I don't think he was joking. I got Carla's new book in the mail recently too. I'm looking forward to reading it.